Beyond Budgeting has now been around for twenty years. More and more companies across the world are embarking on a Beyond Budgeting journey, from global giants to smaller ones not yet strangled by corporate controls and bureaucracy, eager to protect their start-up agility as they grow. The financial crisis ten years ago was a stark reminder for many that businesses need something more agile and responsive than what traditional management can offer, including budgeting – a management technology invented a hundred years ago under very different circumstances. Lately, after years of trying to scale Agile, “Business Agility“ has (finally) become a hot topic. 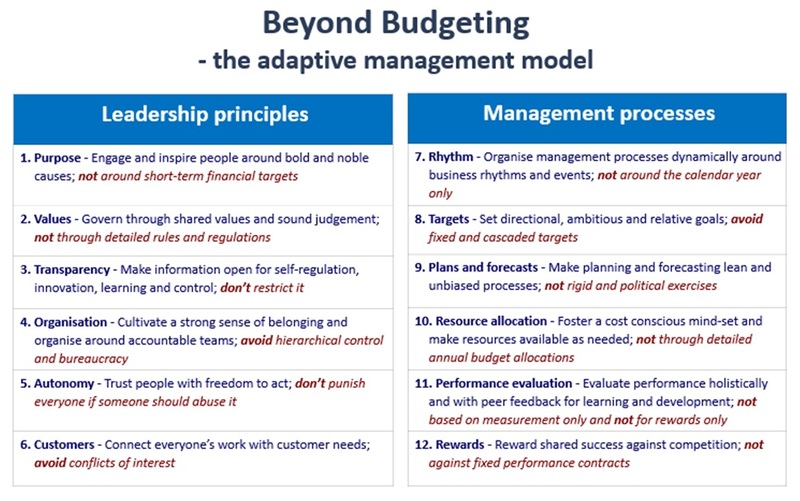 Beyond Budgeting has been on this end of agility all the way back when Agile was only a software development thing. The consulting businesses became interested many years ago. Some of the big firms are even active in the Beyond Budgeting Roundtable. I have always welcomed these guys to the community. We need them, just like we need academia and business schools onboard (which is also happening). Some find the model very comprehensive, almost overwhelming, given the way it addresses almost all issues that need to be on the C-suite agenda, from leadership to management processes. For the consulting business, this breadth of Beyond Budgeting represents a problem. They are typically called in to help organisations with more specific problems. Their projects are seldom about radically changing whole organisations, especially if that involves challenging fundamental executive beliefs. 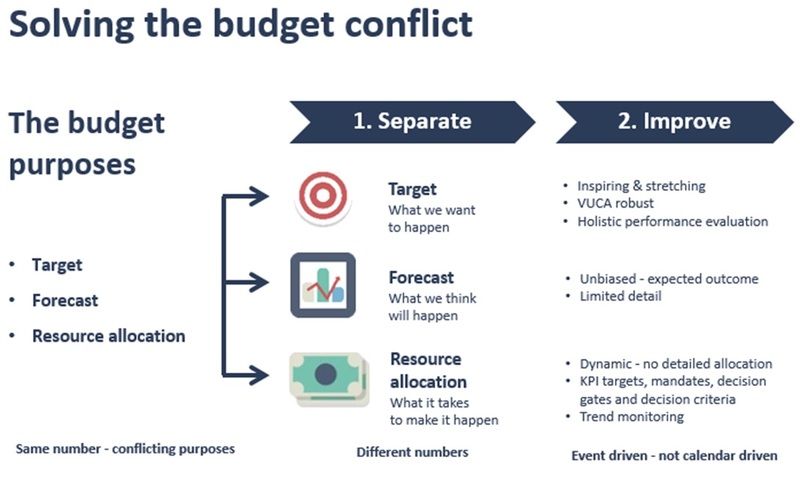 Some consultants have therefore tried to “carve out” elements of Beyond Budgeting as a starting point for their clients. The classic example is “Rolling Forecasting”, where forecasts are updated typically every quarter and typically with a five-quarter rolling horizon. Actually, Beyond Budgeting does not specifically speak about Rolling Forecasting. Principle 7 and 9 recommend a dynamic, lean and unbiased forecasting process. Rolling Forecasting is one way, but not the only way, as we will discuss in another blog. I might, by the way, be wrong, but I believe Borealis was one of the first companies implementing such a forecasting process when we kicked out the budget back in 1995, before there was anything called Beyond Budgeting. At least, we had not heard of anyone else doing this. Fortunately, we avoided the trap described below. Rolling Forecasting is a tempting place to start. Not scary, not challenging any executive beliefs, and something Finance is naturally in charge of. Unfortunately, it too often becomes a dead end, or at least a detour many find it hard to return from. Target setting – what we want to happen. The budget works as a target for production, sales, profit etc., often coupled with bonuses. Forecasting. The budget should provide insights into, for instance, next year’s expected cash flows and financial capacity. Resource allocation. The budget hands out bags of money to the organisation, both opex and on capex. This financial kinder-egg might seem very effective. Three purposes fulfilled in one process and in one set of numbers. But herein lies also the problem; the three do not go well together. How can an ambitious sales target also represent expected revenues? How unbiased is a cost forecast that is also a line manager’s only shot at getting access to resources for next year? The first answer means that the company is implementing nothing but a rolling budget process. Four budgets a year. Much more work, and a lot of pissed off people. The second answer implies less work, but also means that beyond the “forecasting against the December wall” problem, none of the many other budget problems are solved. To make a long story short, separating the budget purposes can’t be a sequential process. It must all happen in parallel. When Rolling Forecasting is introduced, Finance must at the same time provide clear and credible answers on how targets setting and resource allocation now will be solved, separately from the forecast. If a Rolling Forecast becomes something to “deliver on”, or an application for resources, failure is just around the corner. We have unfortunately seen this happen too many times. The consultants do not carry all the blame. Finance is often just as guilty. 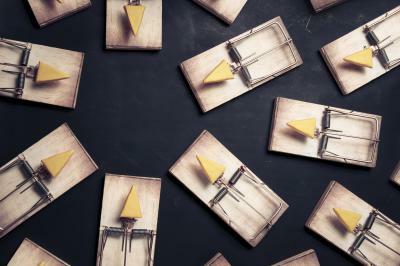 After reading this blog, you have no excuse for falling into the same trap!